One square degree image of the Tarantula Nebula and its surroundings. 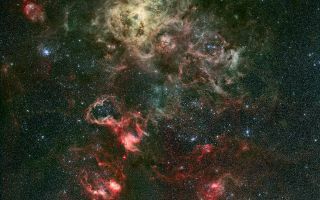 In this space wallpaper, one square degree image of the Tarantula Nebula and its surroundings. The spidery nebula is seen in the upper-centre of the image. Slightly to the lower-right, a web of filaments harbours the famous supernova SN 1987A (see below). Many other reddish nebulae are visible in the image, as well as a cluster of young stars on the left, known as NGC 2100.